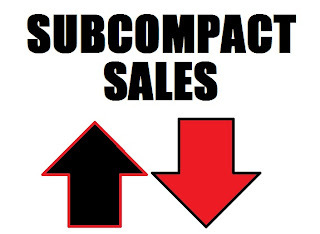 Here are the numbers for 2013's subcompact sales. However, let's start with the month of December. The Hyundai Accent had the biggest monthly gain vs December '12 with a 142% increase. A ways back is the Scion iQ, followed by the Honda CR-Z. With the last two vehicles, keep in mind that if you don't sell a whole lot of cars to begin with, it doesn't take much to make that percentage number look more impressive than it really is. Just sayin'. The big loser for December was the Toyota Yaris, which was down nearly 70% for December. Also down pretty big is the Mazda2 and the MINI Roadster, both down more than 50%. For the year 2013, the best-selling car on the list was the Kia Soul, which moved more than 118,000 units. Close behind was the Nissan Versa at more than 117,000 units. And proving that Americans will buy an American-made small car, the Chevrolet Sonic came in at 85,646 units. Of the vehicles that haven't been on the market for a year, the Buick Encore proved to be a surprisingly strong seller, moving nearly 32,000 units. Finally, the biggest percentage gain in new-car sales in this segment was the Chevrolet Spark, which was up more than 175%. The Scion iQ had the biggest decrease in overall sales, slipping 54%. Table represents sales of cars in the USA. Some interesting numbers. I'm surprised that overall, Dec 13 had more losers than winners compared to 12. And that for the year, no cars had sizable increases, except for the Fiesta (that refresh + ST came at the right time). Lastly, the list keeps growing. I don't believe any car was discontinued from 12, although I suspect several won't see 15 MY. Thanks for compiling these each month. I've enjoyed them.